The Easter holidays are approaching fast and already I know some parents are panicking about how to fill the time, especially if we get a period of wintery weather which can often limit traditional activities like picnics and walks. 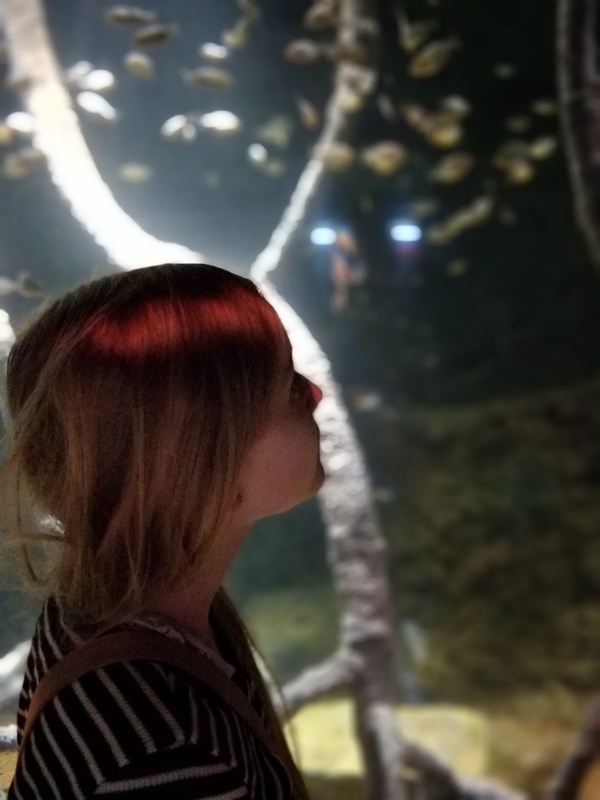 Here are my top five things to do with my children in London ranging from cheap as chips to splurge when it comes to budget. My children range from primary to college age and some activities are more suitable than others if you too have a wider age range. Some of these options are a bit touristy I'll admit but sometimes it's fun to be a tourist even in your own city. 1. Kidzania. My children absolutely adore Kidzania in Westfield London (W12). Dubbed as the indoor place where kids are in charge this is no soft play centre - this is an entire city where kids can learn, work and play and earn "money" while they are having fun. Suitable for ages 4-14 it's not the cheapest treat but it is so spectacular it has to be seen to be believed. Under 4's can go in and there is a small area for them to play but it really suits older children. 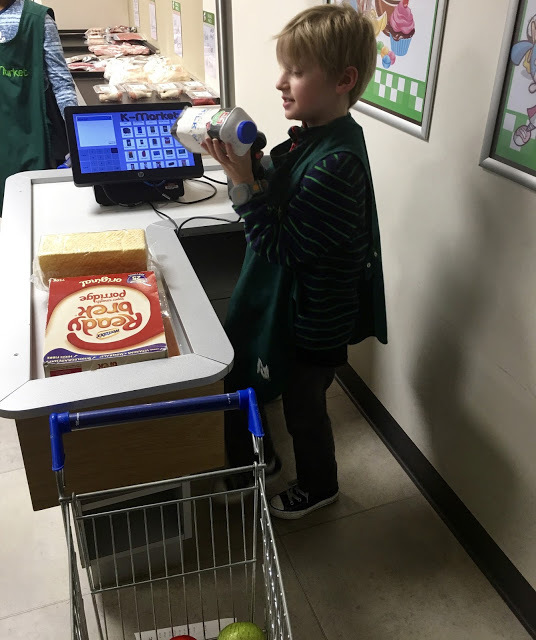 You can read more about Kidzania in this review I wrote after a visit in 2016. Top tip for parents - take a book, some headphones and a loaded playlist and find one of the parents rest areas. The children are tagged and safe and loud. Unless you have little ones or (like me) children with SEND issues you can relax and let them explore independently. 2. Chinatown. From OTT bubble wrap ice creams to bubble tea, Chinatown in London is well worth a visit with children. There's always a great atmosphere and they will love posing for a pic by one of the famous gates. 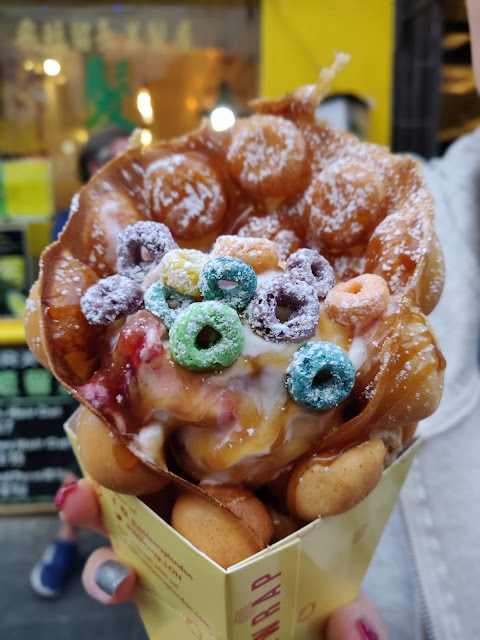 Explore beyond the main street and find fab doughnuts, fish-shaped pastry treats, brightly coloured bubble teas and of course this totally instagrammable bubble wrap ice creams. Take them into one of the many Asian supermarkets to choose some ingredients for a home-cooked meal or treat them to a meal and teach them how to use chopsticks at one of the many restaurants. There are quite a few buffet style options to give them a chance to try new foods. 3. Southbank. From the Tate to the theatrical Shrek's Adventure attraction there is something on South Bank for all ages and budgets. Take a picnic and play in the playground in the shadow of the majestic Coca Cola London Eye or even ride the Eye! You can get discounts if you buy multi-attraction tickets which usually include London Dungeons, SEALIFE London, Shreks Adventure! and more. Read my review of Shrek's Adventure! here. You could take a boat trip down the Thames or simply stroll along the river bank watching the boats and street entertainers. 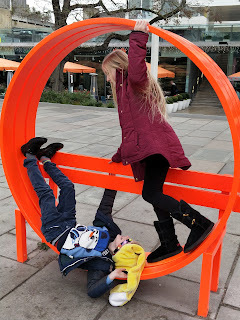 There's always pop-ups and special events on- last year my children had endless fun on oddly shaped benches. Eat in any number of child-friendly cafes and restaurants or pick up something from one of the many street food style premises and watch the world go by while you refuel. 4. Leicester Square. 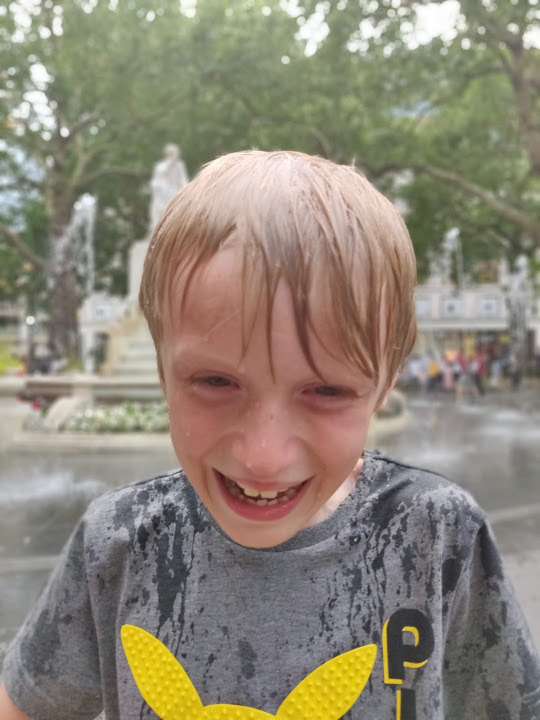 My children love the dancing fountains in Leicester Square and even if the weather is less than balmy will frequently get "accidentally" soaked as the pattern changes and they are left standing in a plume of water. Take spare clothes! We love the Japan Centre round the corner in Panton Street too where you can get everything from cute socks to spectacular sushi. 5. Greenwich. We catch a boat from Embankment pier down to Greenwich and can easily spend the day there. Wear your little darlings out with the hilly walk up to the meridian line then enjoy an ice-cream or a cuppa at the top while you admire the spectacular views. TOP TIP: you don't have to pay to see the famous line - walk round the Royal Observatory which charges admission and do the foot either side thing for free outside the observatory wall. The park has lots to do and see from Roman remains to deer and there's an enormous playground too. We like the free-to-enter National Maritime Museum which has lots of child-friendly activities on offer and enjoy just walking around the lovely town which has great markets, unique shops and lots of lovely places to stop for refreshments. There are of course lots of other fantastic places in London and even just exploring the many parks could fill the holidays. Sometimes it's worth picking one starting point and wandering to see what you discover on the way. We once happened upon a bonkers outdoor tea-dance where there was authentic Caribbean street food alongside cupcakes and tea and free dance tuition all afternoon. It was lots of fun. 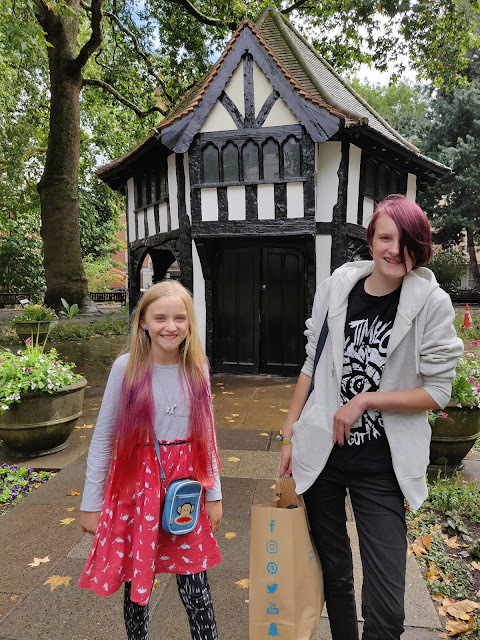 And recently on a shopping trip with my girls to make custom T-shirts in Tottenham Court Road Primark we discovered this amazing little building. We really hope an actual wizard lives in it. Make the most of the Tube obviously but don't forget than most day-tripper or Oyster cards include bus, tram and overground rail services too where you will see more of this historic city. Children under 11 travel free when accompanied by a fare paying adult. Use the big gates at tube stations to tap through with your children. Many contactless cards and devices can now be used like the Oyster card and will be capped so you don't spend any more than if you'd bought a day-tripper card. Check out TFL for details. If you are visiting from overseas check the TFL website too to see if your card or device will be valid or if it will incur extra charges. Don't worry if not, anyone can buy an Oyster card at any underground station or they can be pre-ordered and pre-loaded and delivered to your home if you are organised enough to sort that out well before your trip.